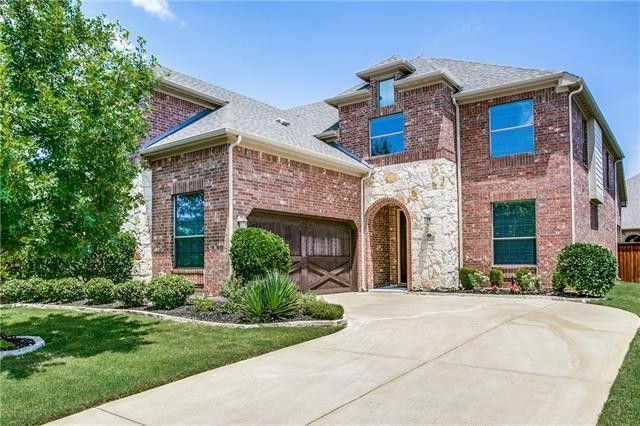 Great Drive up-lushly landscaped in Marshall Ridge North! Stone & brick exterior. Great space & many upgrades! Study, or Formal Dining, at the Entry, recent hardwood floors. Kitchen-butlers pantry, granite, island, gas stainless steel appliances. 2 story ceiling in Den shows off the floor to ceiling stone FP with gas logs. Master is split with French doors to covered patio. 2 living areas upstairs-Game room with wet bar & huge closet (& walk-out floored attic space) plus Media over the garage wired for sound. 3 bedrooms, 2 with walk-in closets up. Plantation shutters & lots of crown moldings! Marshall Ridge is conveniently located Master planned community with pools, parks & sought after Keller ISD. Directions: 114 West, left on 377, u-turn onto 377 North, right on Marshall Ridge Pkway, left on Lewis Crossing, Right on Grand Meadows, house on left.